As soon as I made the call for the immediate suspension of Mr. Joe Igbokwe (Yorubakwe) from his position as the State Publicity Secretary of the All Progressives Congress (APC) in Lagos State for impersonating the National leadership of the party, its National Chairman, Chief John Oyegun suddenly found his lost voice and “latent authority”. In a press release on Friday the 25th of September 2015, and just three hours after I made the call in my article entitled, SARAKIGATE: AS JOE IGBOKWE BECOMES JOE YORUBAKWE, the National chairman of APC called on the State Publicity Secretaries of the party across the States in the country not to speak on behalf of the party on national politics any longer, but to concentrate on their various states politics. This is a belated chicken-hearted approach to dealing with a clear case of insubordination and impersonation. It should be noted that Joe Igbokwe’s (Yorubakwe’s) press release (article) was issued on Monday the 21st of September 2015; and for four whole days, the National leadership of the party led by Chief John Oyegun were deaf and dumb. They pretended and refused to see the implications and consequences of that blunder called press release, until I came up with my article which tackled and countered it and called for Joe Igbokwes (Yorubakwe’s) suspension on Friday the 25th of September 2015. Also, the National leadership of APC, it appears, sees nothing wrong to the open threat by Joe Igbokwe (Yorubakwe) on its behalf to cut off the hands of the Senate President, Dr Bukola Saraki. The truth of the matter is that the life of the Senate President has been threatened and Joe Igbokwe (Yorubakwe) made that threat on behalf of the National leadership of APC; which is yet to denounce the said press release and apologise to the Senate President and the leadership of the National Assembly. Consequently, I am calling on the National Assembly (the Senate) to summon without further delay the National leadership of APC to appear before it and explain why they threatened the life of the Senate President, and why court action should not be taken against the party. Also, the Inspector General of Police should be compelled to effect the arrest of Joe Igbokwe (Yorubakwe) for threatening the life of the Senate President. Conversely, it is very safe for me to conclude that the National leadership of APC teamed up with the Code of Conduct Bureau, Code of Conduct Tribunal, EFCC, the Judiciary , Mr. Bola Tinubu and his cohorts to undermine the office of the Senate President, intimidate the Senate President and at the same time threaten the life of Senate President himself. I have technically refused to include the Presidency but their involvement is reportedly very glaring. (1) Did the Code of Conduct Bureau draw Saraki’s attention to his alleged false declaration of assets before it? (2) Did the CCB at any time invite the Senate President to come and explain why he declared false assets before it? (3) Did CCB at any time query Saraki in the last 12 years for false declaration of assets before it? The truth of the matter is that none of these ever took place; and pronto the Code of Conduct Bureau dragged Bukola Saraki to the Code of Conduct Tribunal, after it had reportedly connived with enemies of democracy in this country. Even though the Senate President was represented by his team of lawyers on the 18th of September 2015, the Tribunal Chairman, Mr. Danladi Umar still went ahead and issued a bench warrant on Senator Saraki on that very first day of hearing the matter. With the above facts, it is evidently and convincingly obvious and clear that the Senate President will never, never, never, never and NEVER get justice at compromised Code of Conduct Tribunal. Conversely, since the prosecutors and the tribunal are on the same page of Plot to nail the Senate President; is it not proper and right for him to prove to the public that he is not only innocent of the allegations but that he is being witch-hunted? It should be noted that I have proved that the Code of Conduct Bureau is incompetent to arraign the Senate President. Furthermore, there is an allegation making round that the Code of Conduct Tribunal Chairman, Mr. Dunladi Umar is under investigation for corrupt practices. If this allegation is true then the chairman is equally incompetent. Conclusively, it means that the allegations against the Senate President lack merit. Having realized that the allegations against the Senate President lacks merit and are more political (98%) than legal (2%), the National leadership of APC, Mr. Bola Tinubu and indeed all those who are opposed to Senate President, are today sponsoring calls for the Senate President to resign his position, since he is facing “prosecution”. For me, I see the moves, calls, and actions, as very childish. The Nigerian Labour Congress (NLC), Trade Union Congress (TUC), a faction of National Association of Nigerian Students NANS (South-West Wing), some compromised activists in South-West etc, have started coordinated calls on Bukola Saraki to step down as Senate President. But I have five simple questions to ask. (1) Where were these shameless groups when Alhaji Abubakar Audu was allowed to contest the governorship primaries under APC, and he emerged their candidate for the election proper, that is coming up in the next few weeks in Kogi State? EFCC is currently probing him for corrupt practices. (2) Where were these insipid groups when Chief Timpre Silva was allowed to contest the APC governorship primaries in Bayelsa State?. He is currently facing EFCC trial for corrupt enrichment. (3) Where have these groups been, when the APC led Federal Government has deemed it fit not to appoint anybody from the South-East into Federal positions so far made? (4) Where did these groups go when the post of Deputy Whip at the House of Representatives which was reportedly zoned to the South-East was taken away on the orders of President Buhari and given to another zone? (5) Where were these groups when the post of Secretary to the Government of Federation, zoned to the South East by the APC, was taken away by President Buhari and given to the North? At this point, let me call for caution. If the Senate President, Dr Bukola Saraki infringed the law then he should be properly arraigned. His present arraignment at the tribunal lack merit and is of no effect. Nothing perhaps will come out of it, except to distract the Senate President, destabilize the National Assembly and finally throw the Nation into confusion. This is what the in-ordinate ambition of one man; Mr Bola Tinubu is causing and costing this country. But then, Tinubu is not bigger than Nigeria. Our President should rise to the occasion and ensure that there is peace and stability at the National Assembly. 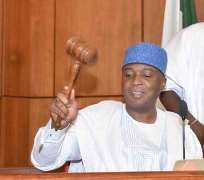 Senator Ike Ekweremmadu should continue as the Deputy Senate President while Senator Bukola Saraki should also continue as Senate President, until their colleagues independently think otherwise. If the Federal Government is sincerely fighting corruption, then let there be a holistic approach to it, not the present witch-hunting and ‘’tinubunised’’ approach we are all witnessing. The attack on Senate President Bukola Saraki is a direct attack and threat on the Deputy Senate President, Ike Ekweremmadu, who is the ONLY Senior Political office holder in this country from the South East; and the Igbo will go to any length to protect that office. As for the outcast and saboteur called Joe Yorubakwe, he is advised to remain in Lagos state and never to return home again. The people of South East have taken a decisive decision against him; and the decision is that he has been declared Persona Non-Grata. This is a lesson to other Igbo sons and daughters who are bootlickers, praise singers and attack dogs, to the likes of Bola Tinubu who are haters of the Igbo Nation. Senior Special Assistant on Media. Forwarded to over 3.2 million email addresses worldwide. Follow me on [email protected] Ikenna Samuelson Iwuoha. Disclaimer: "The views/contents expressed in this article are the sole responsibility of Citizen Ikenna Samuelson Iwuoha and do not necessarily reflect those of The Nigerian Voice. The Nigerian Voice will not be responsible or liable for any inaccurate or incorrect statements contained in this article."